The designs of the armored vehicles have traditionally been compromises between mobility, armor protection and fire power. In an urban setting the mobility aspect is morphed from pure maneuverability into the ability to cross and penetrate barriers and navigate the constantly changing landscape. The armor protection is more important as the fighting distances are shorter and the enemy is often able to engage from extremely short distances and even from above. In regards to the fire power, it’s often more important to be able to suppress the hostile forces rather than to be able to hit point targets at extended ranges. Similar experiences from Lebanon and Gaza have prompted Israel to develop and field several MBT based heavy infantry fighting vehicles and armored personnel carriers such as the Achzarit, Puma and Namer that are based on the T-55, Centurion and Merkava tanks respectively. If two major armies with broad experience of close quarters combat against insurgents in urban environment are reaching similar solutions the need is there. While the Israeli solutions are lightly armed and mainly intended to transport the IDF infantry forces safely to their objectives without getting bogged down into a destructive confrontation with the enemy light forces. As the IDF operates as an occupation force. On the other hand the Russian solution is a fire support oriented vehicle, whose sole purpose is to eliminate all threats as the mechanized force wipes out the enemy entrenched in an urban center. 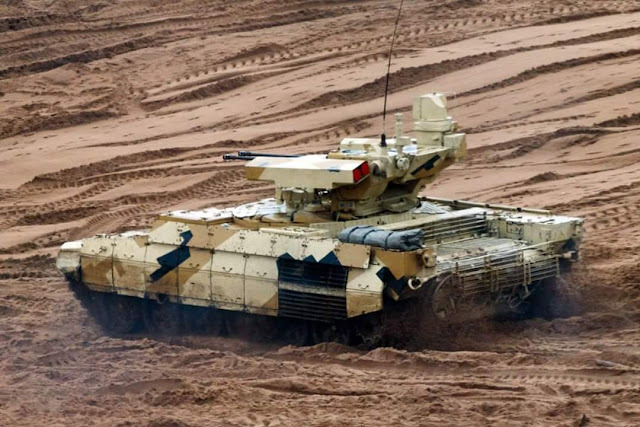 The BMPT has gone through several iterations by Uralvagonzavod. Original version had an T-72B hull and drive-train mated to a turret with a single 2A42 30 mm autocannon and a four-pack of 9M133 Kornet ATGM:s on one side of the turret. This initial version failed to attract any significant export interest or orders by the Russian military. Second revision has a turret with twin 2A45 30 mm autocannons, a coaxial 7.62 PKT machine gun and four 9M120 Ataka missiles in individual tubes. All of the turret mounted weapons are situated above the gunner and commander. Both the commander and the gunner individual optics, with the commanders panoramic sight sitting on topof the weapons package. The T-72 hull was modified to fit extra ERA-armor and two 30 mm AG-17D automatic grenade launchers pointed towards the frontal sector. An important feature for the intended urban combat role was the ability to engage three different targets simultaneously. Also the main guns have an ability to fire to very high angles often encountered near high rise buildings. This version was sold in small numbers to Kazakhstan and Algeria, but the Russian armed forces didn’t place any orders. In 2013 the Uralvagonzavod revealed the next iteration of the Terminator, dubbed the BMPT-72 Terminator 2. This version had a revised turret with more advanced fire control systems and communications equipment. The four Ataka missiles were also placed into two rectangular canisters. The hull layout was revised by removing of the 30 mm AG-17D grenade launchers. At the same time crew was reduced to three.The hull superstructure was also modified with newer ERA armor and a better sloped design. The BMPT-72 was offered as an upgrade package to breath new life into the legacy T-72 fleets that many military's struggle with. 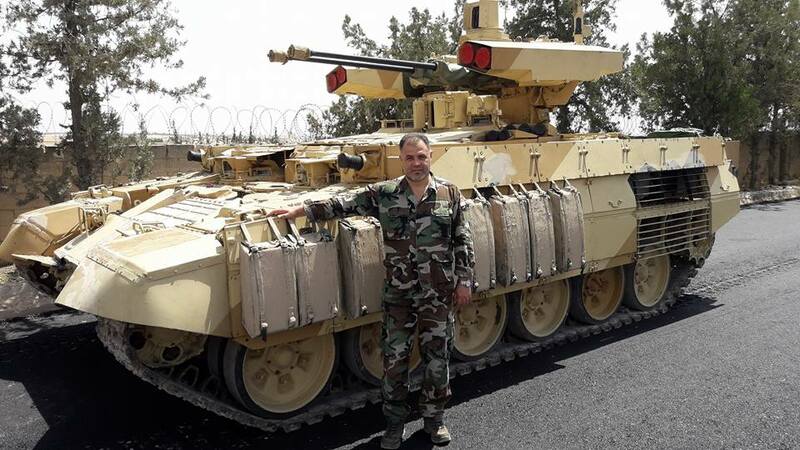 The first actual operational use of the Terminator concept came in 2017 as at least one was sent into Syria to support the government forces. 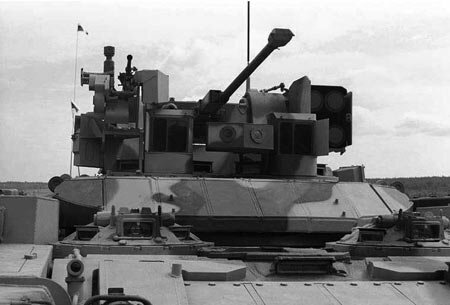 Curiously this variant had the older BMPT hull, with the 30 mm grenade launchers, combined in to the new turret with improved sights and the boxed missiles. Hull was also upgraded with new slat-armor modules at the rear and improved ERA layout. 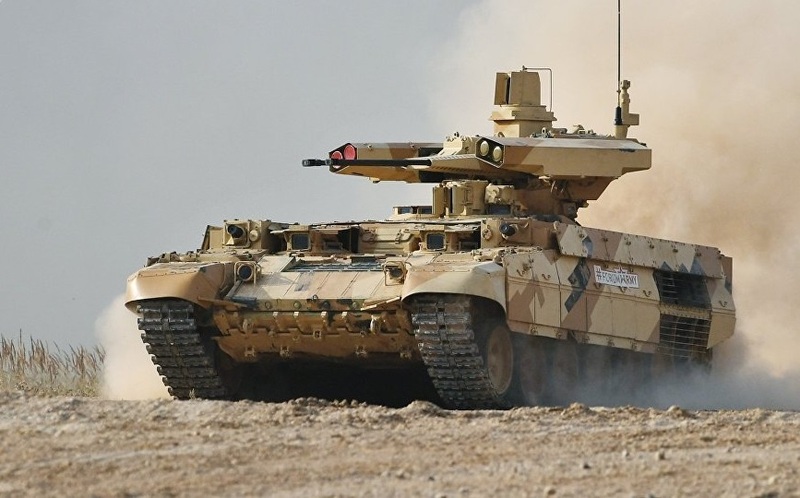 The Syrian model was also equipped with bag-mounted add-on armor modules at the sides of the skirts. These modules have been previously spotted on the T-72B3 tanks. Same version with the older grenade launcher equipped hull and the new turret was shown at the Russian Army-2017 exhibition. During the exhibition the Terminator made several combat shows. It was also announced that the version wold enter mass production, but exact procurement numbers were not released. Later on the Terminator made an appearance at the Zapad-2017 exercise operating with the Russian mechanized forces in the Luga region. It’s believed that at least one example is now used by the 1st Guards Tank Army. BMPT-72 turret with the older hull in Zapad2017 exercise. 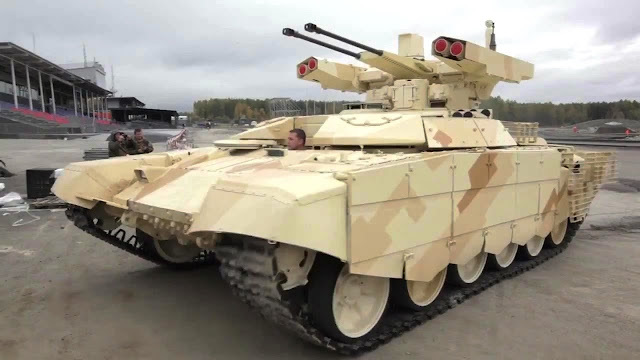 There is also a Terminator-3 version, that is based on the T-14 Armata platform. The issues with the T-14 have delayed the introduction of the Terminator-3 in to the future. 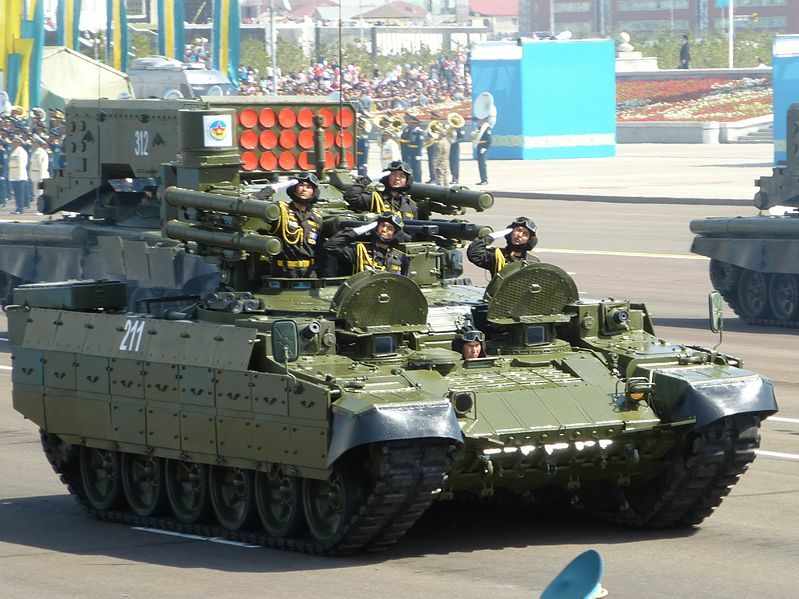 It’s unknown if any have actualy been orderd so far beyond the sinlge prototype shown in the Victory Day parades. It remains to be seen if the Terminator will be a game changer or a sideshow. 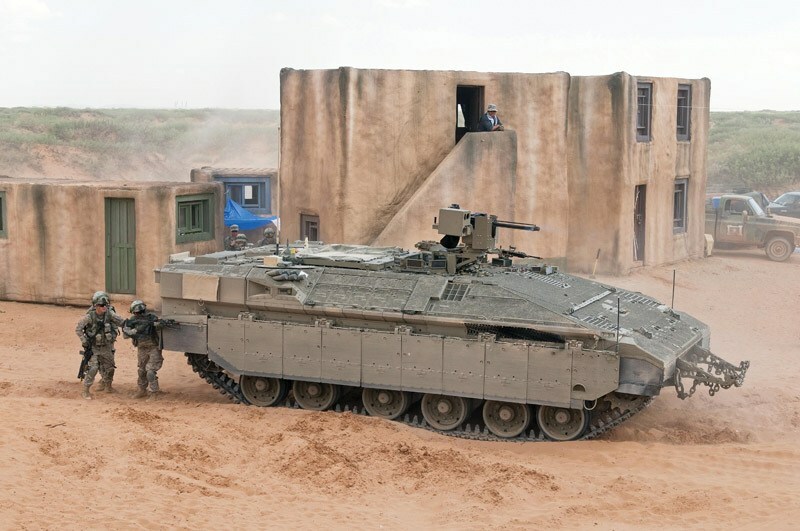 While up-armored IFV:s are here to stay and most nations are adding both ERA and active protection systems to their vehicles, the concept of a dedicated fire support vehicle without an actual high caliber tank gun or something similar is stilla an uniquely Russian concept.